Distributor shaft and gear assembly for all 383-440 Wedge and Hemi engines. Bronze gear assemblies are for Roller Cams. Steel gear assemblies are used for flat tappet and hydraulic cam applications. Wedge and Hemi using Milodon aluminum pump #21815. Use with Milodon Oil Systems #21175, #21185, #21190, #21195. Overall Length 8.187", 6 5/8" of shaft out the gear. #21110 and systems using a Keith Black pump. Overall Length 7.875", 6 5/16" of shaft out the gear. Distributor shaft and gear assembly for all 340-360. Bronze gear assemblies are for Roller Cams. S teel gear assemblies are used for flat tappet and hydraulic cam applications. Both use premium material and will not wear like cheaper bronze version or stock stell cast gears. Permits oil pressure adjustment externally even when the engine is running. Very valuable asset for dialing-in desired oil pressure, for compensating for low oil pressure on street application or excessively high oil pressure on the track (more than 75 PSI hot is usually unecessary and uses extrahorsepower to drive). Required by serious competitors using Hemi engines. 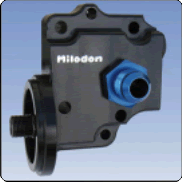 Milodon seals press fit into the cylinder heads and provide a snug, O- ringed contact on spark plug tubes preventing undesirable oil seepage into combustion chambers. Facilitates accurate plug readings.